The Macatawa watershed, which covers approximately 110,000 acres, extends into Ottawa and Allegan Counties and includes Lake Macatawa, the Macatawa River, and numerous tributaries. Lake Macatawa, in southern Ottawa County, Michigan, is an 1800-acre drowned river mouth, which empties into Lake Michigan. According to the MDEQ, the water quality of Lake Macatawa is being impaired by large amounts of phosphorus loading from its tributaries. The Macatawa Area Coordination Council (MACC) is responsible for implementing stormwater management projects to improve water quality within the watershed. Smallenburg Park, located adjacent to Holland High School, was targeted to implement watershed restoration activities to improve water quality, specifically to lower phosphorus levels, as specified in the TMDL for phosphorus in the Macatawa watershed. Previous consultants completed initial design and implementation of these activities. However, upon the fist year of site observation, the MACC determined that the overall effect of the site did not meet their expectations. Niswander Environmental was then contracted to offer recommendations to not only obtain a functional system, but also to create an aesthetically pleasing environment. Niswander Environmental’s task was to create rain gardens, which essentially transform low-quality, aesthetically unpleasant drainage swales into attractive landscaping features planted with perennial native grasses and wildflowers. Niswander Environmental designed and constructed four rain garden areas within Smallenburg Park. Each of these areas had previously been unsightly drainage swales, with weeds and non-native, undesirable species. 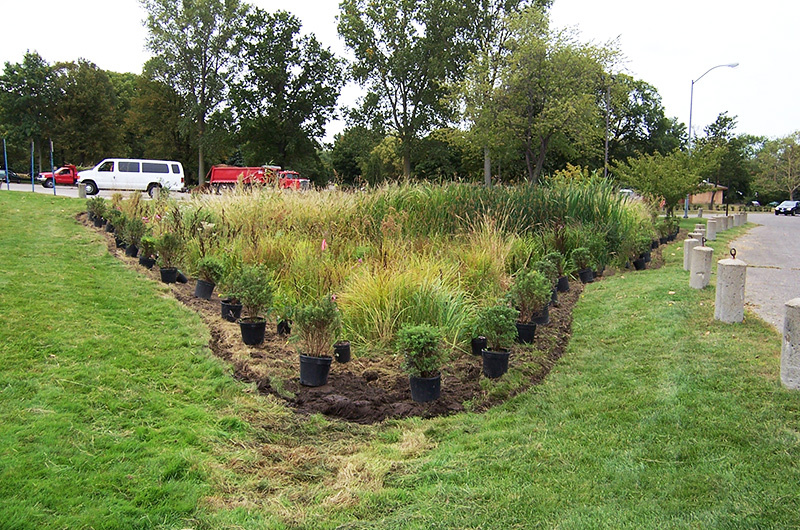 Niswander Environmental first removed all invasive species, including purple loosestrife, Canada and bull thistle, and motherwort, within each basin. Once these species were eradicated, a mulched and planted perimeter was installed with a patterned combination of native shrubby cinquefoil and purple coneflower around each of the basins to provide a consistent, positive visual cue to the presence of a component of the demonstration site. One rain garden was planted with additional native prairie species, including Indian grass, big bluestem, little bluestem, tickseed, and butterfly weed. These rain gardens provide water storage, vegetation for nutrient uptake, and educational opportunities for the general public. Additional recommendations were given regarding basin design and operation to ensure proper functionality was achieved at the site. Not only did Niswander Environmental’s design provide the desired water quality improvement but also created an aesthetically pleasing desirable landscape feature within the Park. The establishment of a formal landscape edge identifies the limits of the natural features setback and will prevent future encroachment and mowing of the natural features. Niswander Environmental coordinated this project with the MDEQ, the Macatawa Area Coordinating Council, Hope College, Allegan County Conservation District, other engineering firms and numerous landowners to ensure that the basins function well as stormwater conveyance and treatment systems to improve water quality within the watershed.